Where do you stand on general western knowledge? Make sure you shine bright. How broad is your general knowledge? How could you improve on it? Ask for a personalized Atlantic Mindset Diagnostic to figure out where you stand on general knowledge as relevant to business settings within many countries around the Atlantic Ocean and the Mediterranean. The international arena requires making sense of a stream of knowledge that transcends rational analysis. The information channels and their levels of credibility are different. Some information may be quantitative, most is not. The information you may receive may be laden with emotions which might be expressed in unfamiliar ways. Yet, you will need to make sense of this wide spectrum of information to quickly bring it to bare on a particular challenge. ​Can you place a painting within an artistic period? Same for classical music? Can you place buildings within cities? What about European literature, or the New World one? Once in the international setting there will be business patterns that you will need to unravel. The broader your general knowledge the better you will be at making sense of the new and disparate wealth of information. Also, lack of general knowledge downgrades you in the perspective of your counterparts abroad. 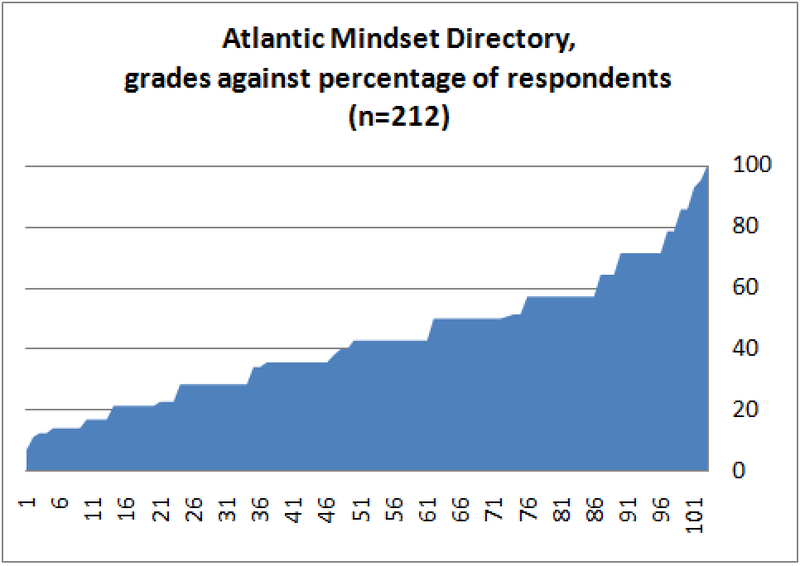 The Atlantic Mindset Directory is a test designed to help leverage the international careers of fledgling managers, well before they might become Directors. The test is focused only on general knowledge as pertaining to Europe and the New World. Blocks of questions seek to diagnose knowledge areas where you might need further development as necessary to legitimate your views on business matters. Feedback will be provided by categories of knowledge, allowing you to identify which areas you should put more effort in developing. The graph above shows the average results for over 200 business people, in the western world, in their early to late thirties. The graph below shows the distribution of their adjusted grades to the share of respondents. Click here to ask for more information about the AMD test. All data will remain confidential.